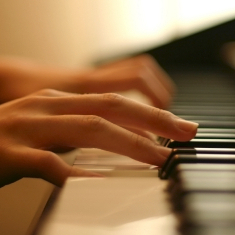 An important piano lesson about five finger exercises. I strongly advise the student, as he advances, to play through some of the Exercises every day, increasing the Tempo gradually but never playing them too rapidly, and paying careful attention to the articulation of the fingers. It is also advisable to play the scales and Arpeggio Exercises straight through without a break in each key. All the Exercises given here should always be played by each hand separately. The following Exercises can be played either Forte or Piano, and may be repeated three or four times, but without fatiguing the hand. Each bar to be repeated four times. 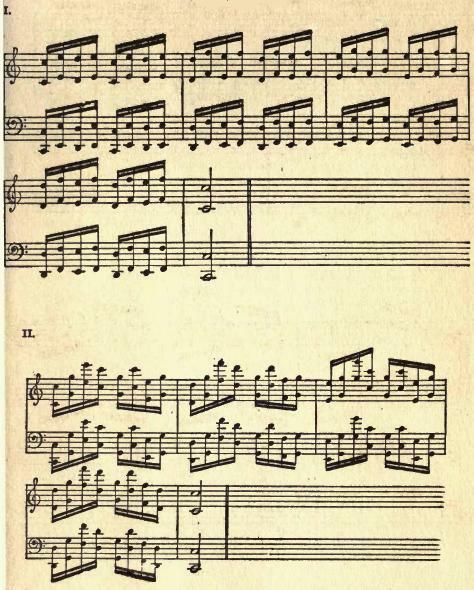 The semibreves to be kept pressed down, and the crotchets to be played with the fingers marked under them, while counting aloud and lifting the different fingers about an inch from the keyboard. The same exercise for the left hand to be played the same way.